I am super excited and happy to be back in Beijing. Thanks Mumu and Markus of Metrowaves for having me! 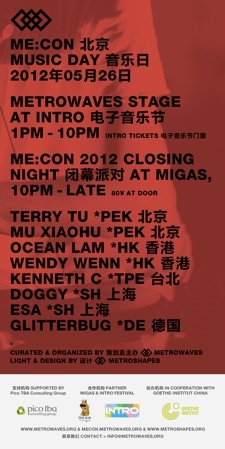 I will be playing live at the Metrowaves Stage @ Intro Festival and DJ at the Metrowaves after party @ Migas in Sanlitun, Beijing. EDIT: The Intro Festival was moved to a different location- find more info here. This entry was posted on Friday, May 25th, 2012 at 3:50 am and is filed under Dates / Gigs. You can follow any responses to this entry through the RSS 2.0 feed. Responses are currently closed, but you can trackback from your own site.